Late Tuesday night a miserable thought burst into my head. “How’s Penny doing! ?” I wondered with a gasp. 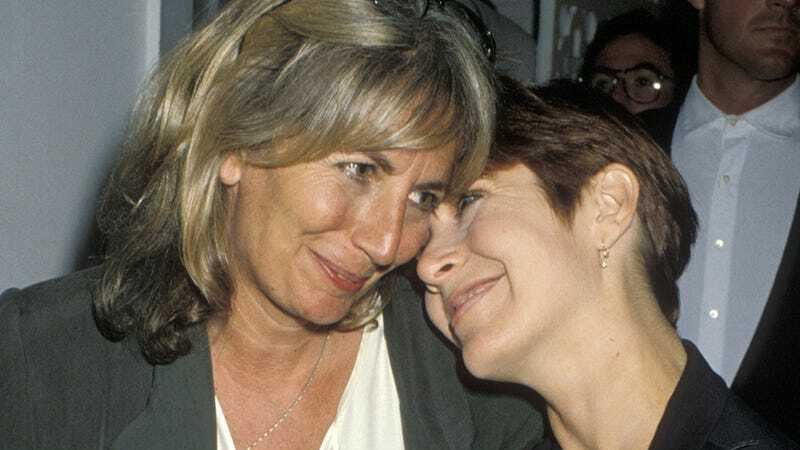 In the span of six short months, 73-year-old Penny Marshall lost both her brother Garry (who died in July) and her best friend, Carrie Fisher. She’s made very few public comments about Garry’s death, and—to the best of my knowledge—none about Carrie’s, but had plenty to say about their legendary friendship in her 2012 memoir My Mother Was Nuts. A high school dropout, she thought everyone was smarter than she was, especially Paul. In reality, she was smarter than everyone. She was brilliant. Everyone knew it. Steven, Lorne, and if you asked him at the right moment, Paul would have agreed, too. Carrie read voraciously. She was funny and clever. She wrote and provided nonstop, hysterical commentary on people, movies, books, and Hollywood, where she grew up the daughter of Debbie Reynolds and Eddie Fisher. She was a one-woman show thirty-five years before she did one. In 1981, the two began celebrating their birthdays together (Carrie’s birthday is October 21, Marshall’s is October 15), and the parties quickly became “major” Hollywood events. We alternated between our homes. No invitations went out; everyone received a phone call telling them the date and time. A few days later, we would receive calls from people asking if they could come. Most guests were longtime friends like Jack Nicholson, Anjelica Huston, and Robin Williams. New people, like Ben Affleck and Nicole Kidman, were added every year. One year David Bowie and Iman crashed. The food was a big draw. Carrie’s housekeeper, Gloria, and her mother’s longtime housekeeper, Mary, made fried chicken, meatloaf, mac and cheese, and other Southern staples. Barbra Streisand wanted to hire them for a party. Carrie wouldn’t let her. Later, Marshall discusses dropping acid for the first time while shooting The Blues Brothers (in which Fisher had a small role) in Chicago. Once night, Carrie, Judy Belushi, and I took acid. It was my first time taking LSD; same with Carrie. It seemed like the thing to do. We played pool for hours and took pictures of ourselves with a Polaroid camera at a hole-in-the-wall bar that guys called the Blues Bar. We thought the cops there were extras from the movie and so made no effort to hide our silliness; but they turned out to be real police officers. So she gave her best friend a call. Fortunately, Carrie Fisher was the new celebrity spokeswoman for Jenny Craig. I called her and asked for some meals. Thirty years earlier we had dropped acid. Now we were microwaving our Jenny meals. What had we become? Fat! In the book’s acknowledgments, Marshall thanks her family first, and then—before her ex-husbands or boyfriends—Carrie. I want to thank Carrie Fisher, my friend and partner in crime for more than 30 years. We’ve lasted longer than all of our marriages combined. Our crazy lives have meshed perfectly. We’ve always said it’s because we never liked the same drugs or men, but I know there’s more to it.